X-ray and gamma-ray observations of distant quasars are being used to test space-time at extremely tiny scales. Certain models predict tiny bubbles quadrillions of times smaller than the nucleus of an atom exist. This "space-time foam" is impossible to observe directly so scientists use other methods to test ideas about it. A new study combining data from NASA's Chandra X-ray Observatory and Fermi Gamma-ray Telescope, and the Very Energetic Radiation Imaging Telescope Array (VERITAS) in Arizona is helping scientists set limits on the quantum nature of space-time on extremely tiny scales, as explained in our latest press release. Certain aspects of quantum mechanics predict that space-time - the three dimensions of space plus time -- would not be smooth on the scale of about ten times a billionth of a trillionth of the diameter of a hydrogen atom's nucleus. They refer to the structure that may exist at this extremely small size as "space-time foam." This artist's illustration depicts how the foamy structure of space-time may appear, showing tiny bubbles quadrillions of times smaller than the nucleus of an atom that are constantly fluctuating and last for only infinitesimal fractions of a second. Because space-time foam is so small, it is impossible to observe it directly. However, depending on what model of space-time is used, light that has traveled over great cosmic distances may be affected by the unseen foam in ways that scientists can analyze. More specifically, some models predict that the accumulation of distance uncertainties for light traveling across billions of light years would cause the image quality to degrade so much that the objects would become undetectable. The wavelength where the image disappears should depend on the model of space-time foam used. 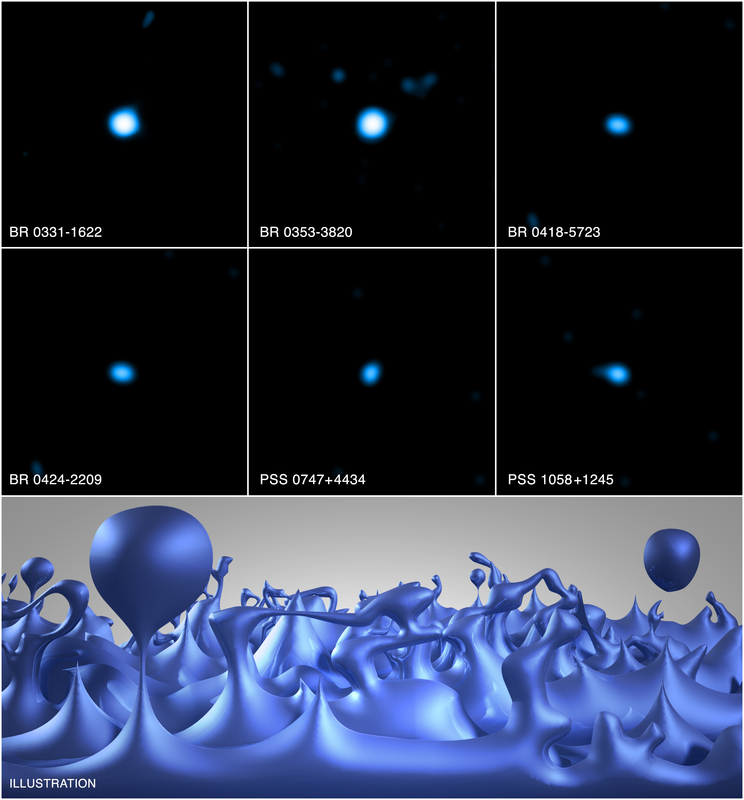 The researchers used observations of X-rays and gamma-rays from very distant quasars - luminous sources produced by matter falling towards supermassive black holes - to test models of the smoothness and structure of space-time. Chandra's X-ray detection of six quasars, shown in the upper part of the graphic, at distances of billions of light years, rules out one model, according to which photons diffuse randomly through space-time foam in a manner similar to light diffusing through fog. Detections of distant quasars at shorter, gamma-ray wavelengths with Fermi and even shorter wavelengths with VERITAS demonstrate that a second, so-called holographic model with less diffusion does not work. These results appeared in the May 20th issue of The Astrophysical Journal and are available online. The authors of this study are Eric Perlman (Florida Institute of Technology), Saul Rappaport (Massachusetts Institute of Technology), Wayne Christensen (University of North Carolina), Y. Jack Ng (University of North Carolina), John DeVore (Visidyne), and David Pooley (Sam Houston State University). Coordinates (J2000) RA 03h 34m 13.40s | Dec -16° 12´ 04.80"
Coordinates (J2000) RA 03h 55m 04.90s | Dec -38° 11´ 42.30"
Coordinates (J2000) RA 04h 19m 50.90s | Dec -57° 16´ 13.10"
Coordinates (J2000) RA 04h 26m 10.30s | Dec -29° 00´ 28.00"
Coordinates (J2000) RA 07h 47m 49.70s | Dec +44° 34´ 20.10"